“Secrets and Holograms” opens with Torra playing a game and ultimately deciding to ask her father if she can join him on a mission. However, he declines, saying that it’s not safe for her; she storms into her room. He leaves a droid in charge of her, but she tricks it into walking her weird dog. Of course, she escapes, leaving the bot holding the soiled creature. Meanwhile, Kaz searches for any tie between Captain Doza and the First Order. Naturally, the two delinquents bump into each other and Torra brings Kaz along on what quickly becomes a misadventure. It turns out that, even as an Ace Pilot, she’s not very popular amongst the normal people in town. The two decide to go back to Torra’s room, Kaz pretending to want to play her game. However, they get a little sidetracked and end up at Aunt Z’s, where Kaz’s friend Rucklin berates him for smashing his ship. Back in Torra’s room, the Droid comes back and freaks out at the sight of BB-8. Torra orders the bot to back down; the Droid says she’s just following Torra’s father’s orders. Rucklin tells Captain Doza that he saw Kaz sneak into his office, but Doza orders him to stop wasting time and empty the trash. Torra comes in and shows Kaz a secret back door with no guards posted. The two and BB-8 narrowly escape, which Torra says is awesome. She asks if he’s a spy, and he lamely lies that he left the Navy to become a racer and that’s it. Torra tells him to go home. Torra’s father comes back and offers to take her on a cruise as she wonders who Kazuta really is. It’s about time they properly explore Torra’s character, being that she’s on all the posters and promotional art and we’re (I assume) halfway through the season. Overall, her boredom and frustration with her father in “Secrets and Holograms” is very familiar; anytime there’s a young girl with a single father in a kids’ show or movie, the dynamic is exactly like this. He’s overprotective and underestimates her, and she’s reckless and unappreciative. This isn’t automatically a bad thing; the trope has been used well before. Triton and Ariel have a similar relationship in The Little Mermaid, and it’s the heart of the movie. However, these characters and this story have no heart. Torra’s interactions with Kazuta, her father and the droid assigned to watch her have no weight because we’re not invested in her. So far, literally all we know about her is that she’s an Ace Pilot, she doesn’t always get along with her father, and Kaz may have some kind of crush on her. None of that comes as a surprise anyway; she’s a teenage girl with a single dad in a kid’s show, like I said. Of course, they bump heads. And Kazuta seems too willing to trust people in general, particularly pretty girls. Yet despite this backfiring in the cases of Hype, Rucklin and others, Kazuta never seems to learn anything. I assume they’re going to use Synara as the catalyst for some kind of change in Kazuta in this regard, but I may also be giving the writers too much credit there. I did find it interesting that the townspeople don’t like Torra and her father; I genuinely thought she would be swarmed with fans as an Ace Pilot. It makes sense that they dislike the Captain, since he works with the First Order so he must be morally compromised to an extent – although we have yet to see him do anything that bad. Honestly, I keep wishing they would actually show us what’s so bad about the First Order themselves. Nazi imagery and the color red aren’t enough to make them formidable villains, or interesting characters, for that matter. Even Captain Doza himself says the First Order are worse than the small-time crooks they normally come across; it would be really cool to see an act of evil on the scale of Tarkin blowing up Alderaan from them. Even in the movies, I’m not sure I understand what the organization wants other than to emulate the Empire. And even then, what’s the point of that? What do they seek to accomplish, and what, specifically, have they done to warrant the fear and hatred of every major character? It’s interesting that they brought Rucklin back in “Secrets and Holograms;” I had completely forgotten about this character, but since he’s back and conspiring against Kaz, they must have plans for him. He’s marginally more annoying than Kaz because he’s very whiny and has a victim complex. Tam, Yeager and Neeku are entirely absent from “Secrets and Holograms,” and while Yeager is still my favorite character (though mostly by default), I won’t complain about the lack of unfunny Drax and the galaxy’s biggest stick in the mud. I have to say, it’s a pretty bad sign when I’m relieved not to have to see and hear most of a show’s main cast. The comedy in “Secrets and Holograms” isn’t very good, but I did chuckle when Torra’s pet Bubbles pooped all over her droid, who then exclaimed, “Oh Bubbles why?” Definitely a low-class joke, but the only funny moment in the episode is worth pointing out. I’m not sure why this episode is titled “Secrets and Holograms,” as there aren’t any more of either than usual. Sure, Kaz isn’t being entirely open with Torra, but we already knew that. If anything, the holograms are less significant this week since we actually see some First Order troops in person. Of course, they’re still trying to get Captain Doza in on whatever their plan is. Overall, “Secrets and Holograms” is another stinker. However, like “The Platform Classic,” it does offer some interesting ideas and a funny scene. As I previously mentioned, I also appreciate Neeku and Tam not being in the episode, and their absence makes Kazuta slightly less annoying. His personality is terrible, but his bickering with Tam and constantly explaining things to Neeku is painfully annoying. Going an entire episode without any of it shows what a difference it makes. But for better or worse, “Secrets and Holograms” is really about Torra and her relationships with Kaz and her father, respectively. We don’t really learn much about her, and Kaz doesn’t change throughout the episode, but at this point bad is a huge improvement over the schlock the season started out with. Torra’s voice actress, Myrna Velasco, is also one of the best in the show; unlike Christopher Sean as Kazuta, for example, she really makes the role her own. She makes Torra seem like a real person with feelings, even if she’s one we don’t know much about. At this rate, maybe Resistance will eventually be good, or at least average. Again, though, I’m probably being a little generous there and won’t be getting my hopes up. 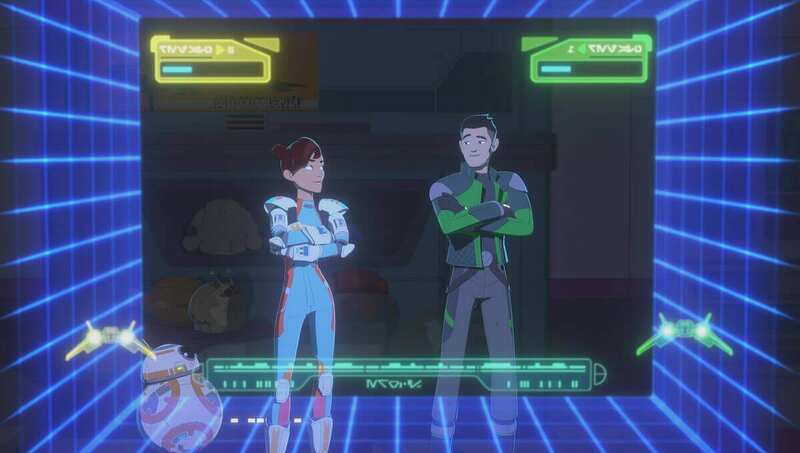 Star Wars Resistance - "Secrets and Holograms"
“Secrets and Holograms” is another stinker. However, like “The Platform Classic,” it does offer some interesting ideas and a funny scene. I also appreciate Neeku and Tam not being in the episode, and their absence makes Kazuta slightly less annoying. His personality is terrible, but his bickering with Tam and constantly explaining things to Neeku is painfully annoying. Going an entire episode without any of it shows what a difference it makes. But for better or worse, “Secrets and Holograms” is really about Torra and her relationships with Kaz and her father, respectively. We don’t really learn much about her, and Kaz doesn’t change throughout the episode, but at this point bad is a huge improvement over the schlock the season started out with.